Hummingbirds, and I'm talking about only one species, Ruby-throated Hummingbirds, are a bit of a mystery to me. I've seen them in the forested area of the Wissahickon in May if not April. But we never see them in our yard until July. I believe that the ones that we see in our yard, feeding on Monarda, Trumpet Honeysuckle, and other flowers and insects, are either females or young. Common wisdom seems to be that at this time of year most yard hummingbirds are female or young. I don't have any reason to believe that this isn't true. But I also haven't ever had the time to really investigate why this is the case. I have been able to notice what I've seen though. And nearly cried in desperation. How in the world can you capture something so small and so active? The wings are just a blur. Last year I had few successes. But this year, especially since I've been doing field sketches on a regular basis, I vowed to do a better job with hummers. The painting at top is a composite from a number of photos of one or two hummingbirds from one night last week. I've never really been able to figure out how long the wings are, or where they're placed on the body, or what they look like in flight. These watercolor sketches try to portray some of those answers. This is not a realistic portrait as you could well guess. There were no hummingbirds sitting together on a tomato cage like in the painting. This is the same bird seen in different photos and just plopped together on the page. In real life hummingbirds are feisty and would be very unlikely to sit together like that. When we see two in the garden you can bet that they're fighting. And this is part of my lack of understanding. If they're females they're not fighting for territory are they? Or are they in fact fighting for food sources? As I said I've vowed to draw them more this year. The photo above is a composite photo of a number of field sketches where I just cut out the hummingbird drawings. Slowwwwlllly I'm getting comfortable drawing them. One problem though is that you can't see that much with the naked eye. If you use binoculars then you have the problem of memorizing what you see, putting down the binoculars, and then putting it down on paper. I thought that I'd solve the problem this summer by setting up my scope in the kitchen and focusing it on a part of the backyard where I've often seen hummingbirds. Of course every time I did that the birds disappeared and we couldn't move in our own kitchen since the scope and tripod took up so much room. Finally I abandoned that tactic. In the end I've used a combination of naked eye field sketches and works based on photos as seen at top. One particularly difficult part is showing their wings when they're hovering. I don't believe this can actually be seen and understood with the naked eye. Even the photos I've taken of them with hovering wings have been fuzzy. Finally I decided to do a 15-minute painting based on such a photo. The virtue of a flash painting like this is that you don't have time to worry about details. You just put down something. I'm not really happy with the background here. It competes too strongly with the hummingbird. But I'm happy with the bird. 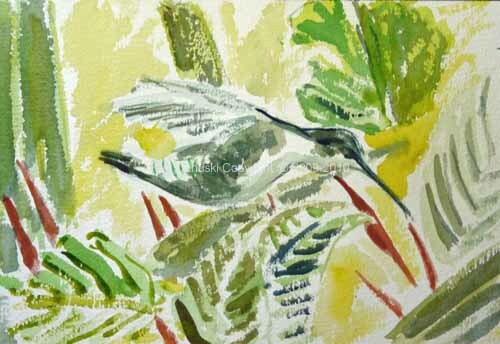 A quick painting forced me to use shorthand to render the bird in flight. It's given me some hope for a real painting one day. Maybe by that time I'll know a little more about Ruby-throated Hummingbirds. As I was out walking along the Wissahickon today, sketching and counting birds, I ran across the huge rootmass of an overturned tree. Looking at all the complex shapes, textures, areas of light and shadow I couldn't help but think it could make a good subject for a drawing or painting. Then I shuddered. Why? Well I asked myself if I was really interested in drawing or painting the complex structure. Definitely not. It held no interest. Unlike the surrounding birds, trees, water, sky and clouds. It's only real interest, at least for me, is that it would be a challenge to render the complex mass into two dimensions. But I realized it would be a technical challenge and nothing more. Not all artists would look at it this way. There are some artists I think who do take pleasure in looking at and portraying such structures. But many don't. Instead I think they think of it more as a technical challenge, which it undoubtedly is. And of course I can't really speak for other artists. Only they know why they do something. But I think I can read the audience pretty well. Many people like art that shows evidence of work. What better evidence of 'work' than being able to render the complexity of such a rootball into two dimensions? When I looked at that rootball today I thought about drawing it for a second then felt the cold chill of depression. It was really depressing to think about drawing it. I think that's because it would have been nothing more than a technical challenge for me, i.e. WORK! It's hard, and probably inaccurate, to gauge what most people who look at art think. I know that some really love it. This is evident in the joy with which they talk about it. But for many others I think it's something that makes them uncomfortable. They know art is supposed to be something good and civilized, but they don't know how to judge it. So one way is to try to gauge the amount of work that went into it. If you can see it took some work then it's good. But this is such a sad, misguided way of appreciating art. It almost turns art on its head, from something that should be enjoyed or at least found moving, to something that can be measured, even worse measured by a Puritanical tape measure - how many hours went into it, how much time spent rendering all those shadows, each of those infinitesimal rootlets. Well all of this leads me back to my theme of the last week or two: subject and background. I've shown paintings with no background and with complex backgrounds, one background based on the complex shapes that I actually saw, the other based on a loose representation of what I saw. I did two other watercolors at the same time and they're both above. At top is a number of juvenile Wood Ducks seen at Morris Arboretum wetlands lasst week. 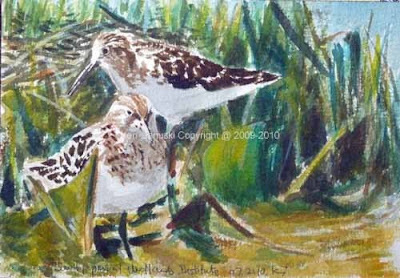 Immediately above are two Least Sandpipers seen at The Wetlands Institute in Stone Harbor, NJ in May, 2010. Another way to unite subject and background is through a unifying theme of light. Or pattern. 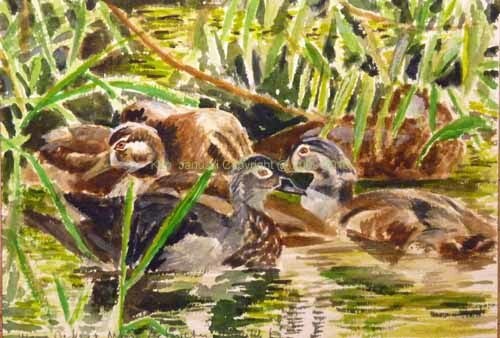 The Wood Duck painting has both: light and pattern. The Least Sandpipers has light but less pattern. 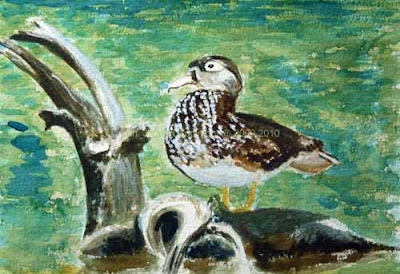 But both show that there are additional ways to unite primary subject and background in art, specifically wildlife art. When I criticize art that looks like work I don't intend to indicate I'm lazy and only like the work of lazy, sloppy artists. I work a lot on my art and probably worked even more, in the sense of time spent, on my abstract art. I don't think that good art comes easy. It does entail work just like any worthwhile endeavor. But I think the difference is that good art actually seems effortless. The audience shouldn't even realize how much work the artist put into it. They should first enjoy or be moved by it. Only later maybe they'll consider the work involved. But even then WORK may be something that's only visible to those who know something about art. I hope that the sense of light in my wood duck painting is enjoyable. But it was some work to figure out what areas to make light and which dark. This is the type of work that you can rightfully expect of an artist, making professional decisions about his work to make it as strong as possible. Just like you appreciate a car that runs reliably but don't really care to know the specifics of the engineering. Imagine how much less enjoyable your next ride would be if you had to listen to a recital of all the technical decisions. This is painful, a Puritanical notion of art and engineering. You just enjoy the car for the reliable ride and art for the enjoyment it provides, no, non, nein, uh-uh for the work involved. I'm very happy with the two watercolors I showed in the last post as well as two others done at the same time but not yet posted. 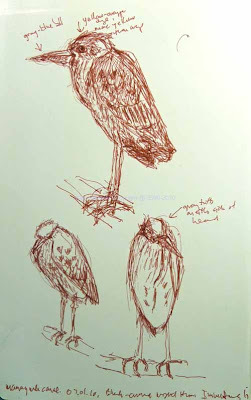 They're indicative of what I'd like to accomplish in my bird paintings. So why they keep showing these field sketches? 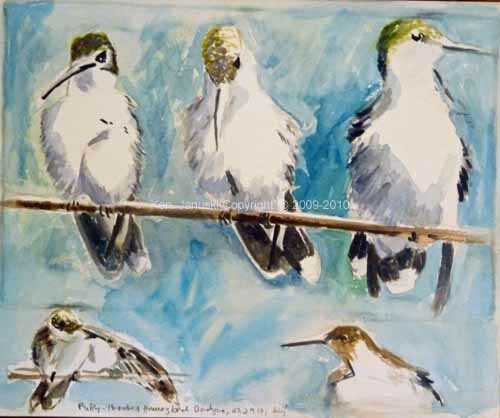 I think it's obvious from them that I'm someone who probably has more of a background as an artist than as someone who has drawn many birds from life. This is largely true. 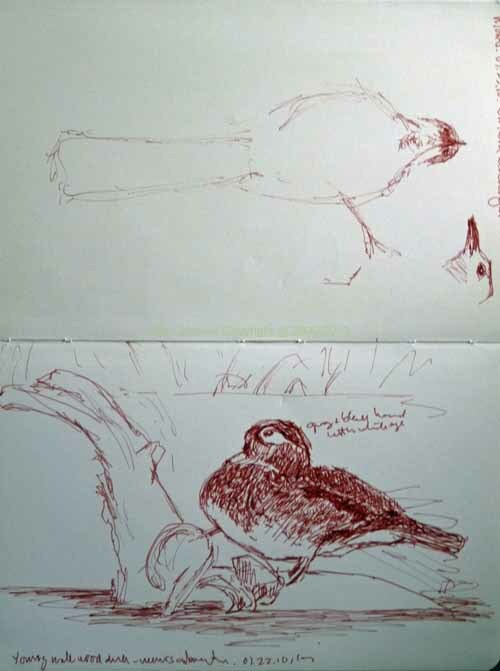 But as I've said many times I both believe in the importance of field sketching and enjoy it, even though I may whine from time to time. So I keep at it. There are people, many of whom can be found at links at right, who are thoroughly adept at field sketching. I'm not but I keep at it. So I show these both to show my improvement (I hope) and to serve as an example for others. I don't think field sketching is much appreciated in America, at least nowhere near as much as in Britain and I suspect much of Europe. 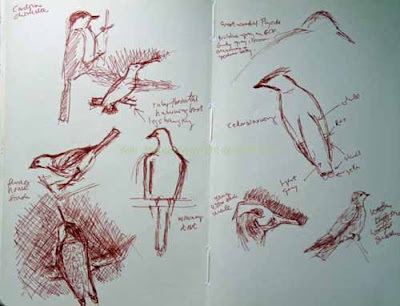 How often have you seen people sketching when you've seen a large number of birders congregated? Very few if any I'd bet. So that's the excuse for these. The sketches above are from my backyard: Carolina Chickadees, Northern Cardinals and House Finches predominate. The page above portrays more yard bids on the left: Ruby-throated Hummingbird, Carolina Chickadee, Mourning Dove and House Finch. 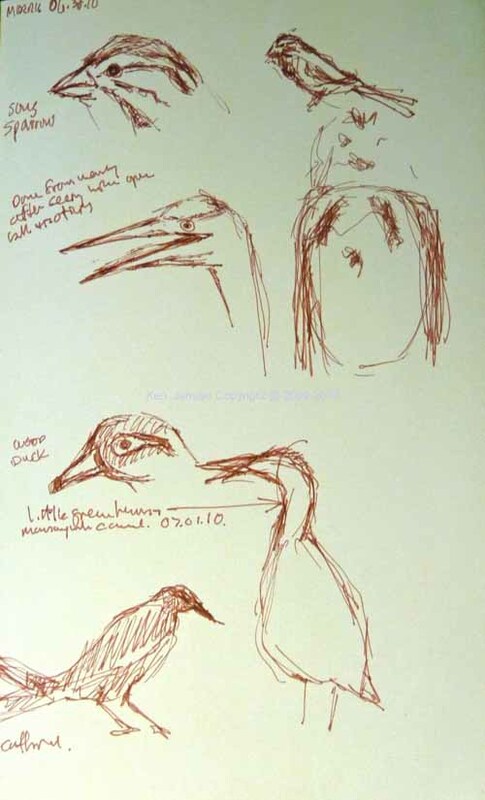 On the right are sketches from Morris Arboretum wetlands. At top is just a hint of a very active Great Crested Flycatcher, gobbling down Cicadas I think. Also a Cedar Waxwing, young Wood Duck and young Tree Swallow. Above on the top portion, turned sideways, is a Northern Mockingbird. On the bottom a young Wood Duck. I'm not happy with the Wood Duck. About the only thing right about it is the inflated chest. But I show it as an example of how a field sketch, perhaps coupled with photos taken at the same time can lead to a painting. That's what you see below. I'm not happy with it either. But the scene struck me: the lone Wood Duck with chest thoroughly puffed out, dominating the small log in the water. By making the field sketch I helped to burn the experience in my memory. I suspect another painting is on the way. Immediately after finishing the American Oystercatcher of my last post I started some new paintings, all of which had backgrounds. Actually there was a flurry of paintings, helped a bit I'm sure by the fact that I had no internet connection and so could devote myself to painting. No distractions! I'm only showing two here and will show the others in another post. The top one is a more developed watercolor on 9x12 inch 300 pound Arches cold-press watercolor paper. 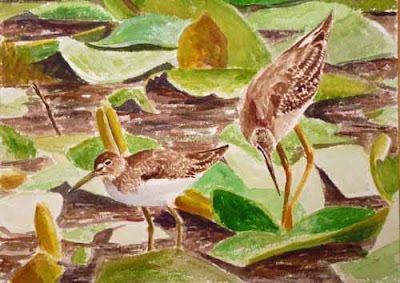 It's based on photos I took last year of a Solitary Sandpiper and Lesser Yellowlegs that completely disappeared in the mud and water lilies at Crane Creek State Park in Ohio. 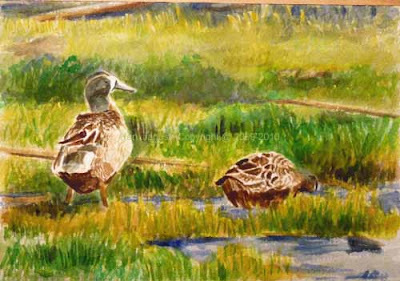 The combination of the way that the birds were so well hidden against the background as well as the fascinating pattern of the water lilies has helped to make me want to keep painting the scene. I also did another version last fall, though I wasn't happy with it. 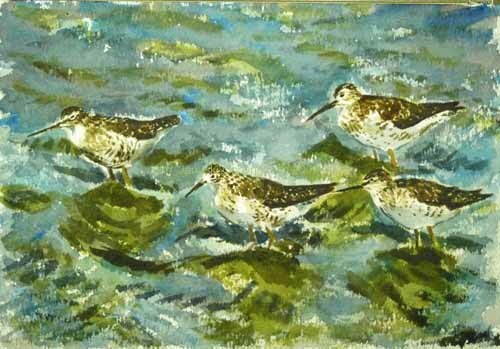 The second watercolor, on some very old rough 140 pound Arches watercolor paper, is of some Greater Yellowlegs seen at Heislerville WMA in New Jersey this spring. In the top painting I've tried to be pretty accurate in the background. Because the background is primarily the discrete shapes of the lilies I think I wasn't quite as scared off by it. The problem of course, just llke my version last year, is that it's easy to get a little too tight, to tend too much toward coloring in the shapes. This is a great improvement over last year's version. But I think I foresee another version on the horizon at some point. The second painting on the other hand has only the vaguest connection to a realistic background. I've changed the color of the water drastically, though the pattern of the waves is somewhat accurate. Nonetheless I do really like this painting. There is something vibrant about it and you can still understand the scene. So in my last three paintings I've shown three different ways to deal with background in bird art. I didn't plan to do this. It's just that each scene seemed to call for a different treatment. So that's just what I did! One of the beauties of art is that you can do exactly what you want. 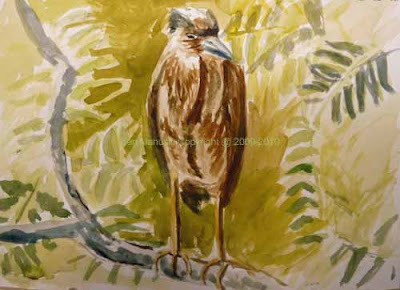 Birds live in an environment, not in the idealized frame of a painting or drawing. 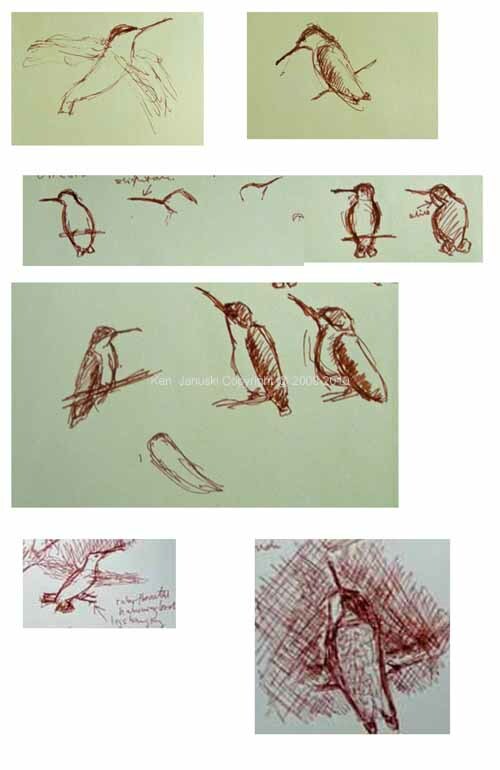 So I've never been that fond of bodiless bird 'portraits' or bird 'vignettes', where they're centered on the page with a vague background that disappears into blank paper as it nears the edge of the frame. Consciously or not I think most artists who use birds as subjects, or even animals in general, make a decision about a background. Should I use one? Should it be so detailed as to almost conflict with the primary subject but nonetheless be true to how the bird actually exists? Should it be something that's generalized from something real? Should instead the pattern of marks, patterns, colors, values in the painting become as important as the subject itself? Many questions and many individual answers. Recently I've been trying harder to include a background that is representative of the one that my bird subjects live in. That was true in the Blue-winged Teals of my last post. 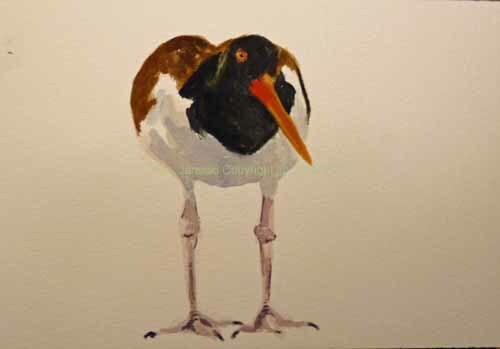 But today, after I'd finished painting this American Oystercatcher, I just couldn't see how a background would do anything but detract from this. Sometimes you do a simple work, that seems to get the essence of what you're trying to portray. Then any addition seems extraneous and distracting. That was the case here. Not too much to say about this except that I decided that I wanted to start doing some of my small watercolors on good paper just as I do with my large watercolors. I like using lesser quality paper because I don't get precious about it and can be more experimental and freer. So I often use it for my quick and small watercolors. Once I know I'm using good paper I, like most artists I suspect, start tightening up and being more careful. The problem with the lesser quality paper of course is that if you do a painting that you're happy with you have the problem of it not being on the best paper. With that in mind I started a new 7x10 inch watercolor yesterday on Arches 140 lb. Rough paper. I suspect I bought this centuries ago when I liked watercolors that showed a lot of paper texture, the kind you get with Rough paper. I can't remember having any interest in that recently at all. So this is probably really old. But it's still good paper and I was happy to use it. The subject is two Blue-winged Teal, seen in 'The Meadows' at Cape May this spring. It's probably hard to believe that I spent 7 hours on this little watercolor but I did. Sponging, white gouache, opaque and transparent watercolor colors all played their part as I tried to get this painting to work. It did work yesterday but the colors just didn't sparkle the way that I wanted. So I spent another two hours trying. It's improved I think but still isn't quite what I'd like. I think it's time to move onto something new or another version though. This watercolor has already been through a lot. 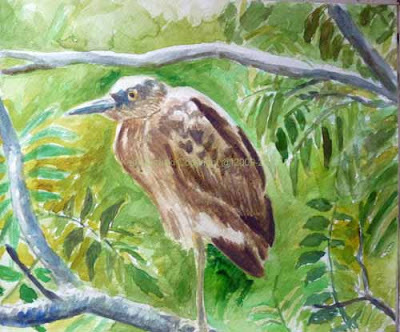 I knew when I did the field sketches of the probable Yellow-crowned Night Heron last week that I'd want to do some paintings as well. Immediately above is a quick sketch that I did last week soon after the sketch. The image at top is a much more developed watercolor on good paper that I did today. In both I took advantage of the decorative pattern that the surrounding foliage offered. I also tried to be true to the colors of the bird and its surroundings. The many green leaves, turned white or yellow in bright sunlight, also turned the muddy water gold, yellow and green through their reflections. The bird itself is fairly nondescript, mainly brown markings on off white or more brown. 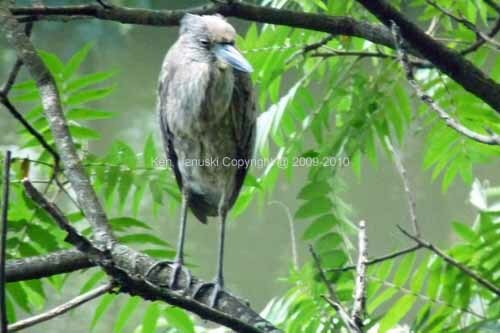 Only the blue-gray bill and some blue-gray on head, and of course the yellow eye, gave much real color to the bird. 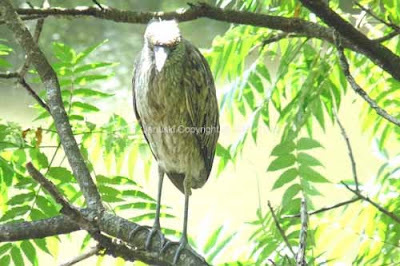 As I said last time when I posted the photos I did so because I wanted any readers of the Pennsylvania Rare Bird List who questioned the likelihood of an immature Yellow-crowned Night Heron to have a place to see the photos and sketches. I've not heard back from anyone questioning this ID so I think that most likely I'm correct in saying the bird I saw and painted was an immature Yellow-crowned Night Heron. 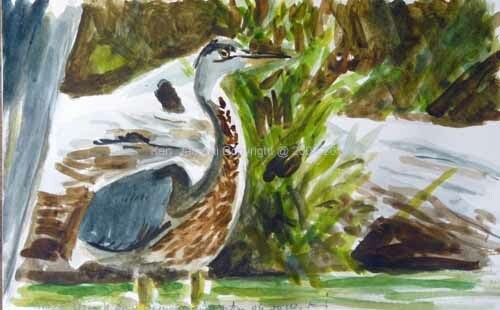 Herons are just the best birds for painting and drawing so I feel lucky to have seen so many recently. Yellow-crowned Night Heron et al. 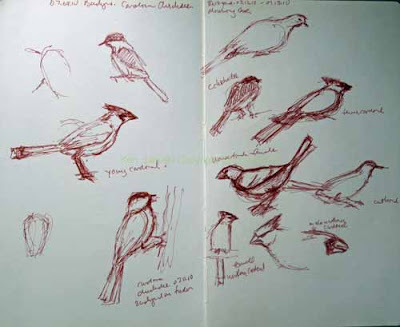 I'm doing something unusual with the blog today, using it as documentation for a bird sighting. As regular readers know I rarely post photos here. If I do when I actually look at them they always disappoint me. I just prefer art. But in this case it seems that it's somewhat unusual to see Yellow-crowned Night Herons in Philadelphia so I'm posting some photos for anyone who reads the Pennsylvania Rare Birds List and wonders about the bird. 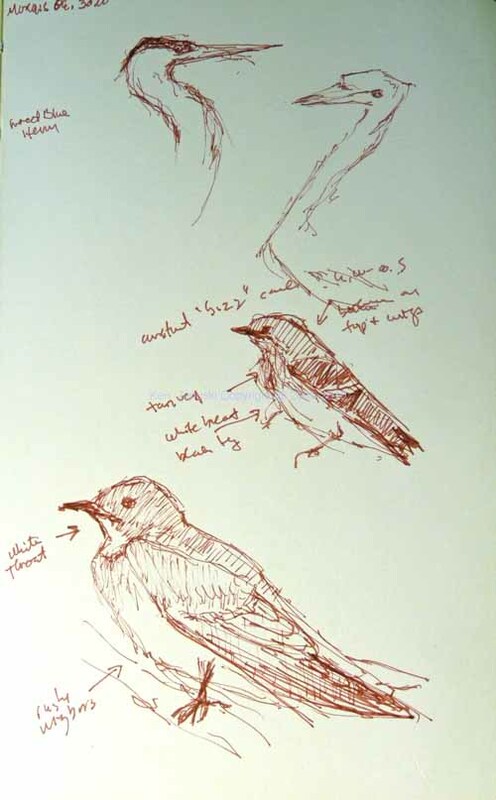 And of course I'm showing field sketches. The last few days have been great for seeing Great Blue Herons, Green Herons and the immature Yellow-crowned. I'm not that familiar with Night-Herons and when I saw this one, less than 15 feet from me I immediately thought Black-crowned. That's the species I see much more often. But I double-checked with the field guide when I got home and Yellow-crowned seemed more likely. Why? Well a lot of that is thanks to my sketches and field notes. I was struck by the short, stout bill, the blue-gray color of bill and they yellow eye. Also there were fine markings which I tried to get down on paper. All of those point to Yellow-crowned based on my Sibley. Also the head was grey blue on outside and tan in center. No field guide mentions this but it seems more similar to the adult yellow-crowned. One lesson I relearned with this is that you see more with your eye than with a camera. I wrote notes about the bill being blue-gray. In some photos it looks like this but in others it looks yellow. That's what I don't like about photos. They seem so clear when you take them, then not so when you get home. For this I'd rather trust my eye. And when you have to get it down on paper, you really do have to look more closely. That's how I noticed the fine streaking under chin on neck, and the one darker streak down center of chest. Perhaps someone will convince me that this is not a Yellow-crowned, and I'm certainly willing to listen to good arguments for something else. 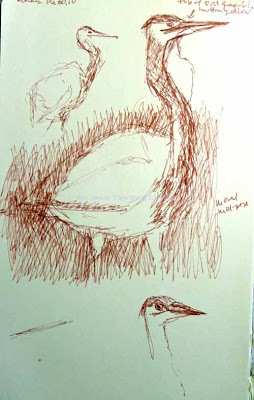 But I think it is a Yellow-crowned and I'm really happy that I spent so much time trying to draw it. Sadly I did exaggerate the bill size but not shape in one of the drawings. Below are works based on the other herons I saw over last two days. At top is a watercolor of a Great Blue Heron, based on sketches and photos from Morris Arboretum. 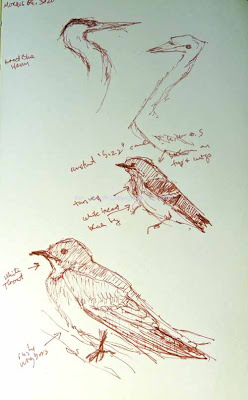 This is followed by two pages of the sketches from that day as well as two sketches of Northern Rough-Winged Swallows. 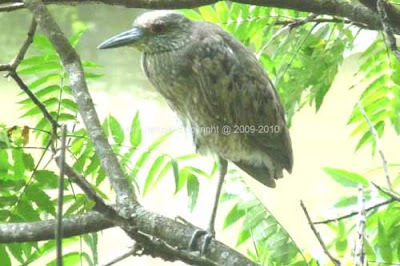 And finally a young Green Heron, one of three Green Herons, also seen at Manayunk Canal. Unfortunately he just didn't stay long enough for me to get much of a drawing or show the tufts of feathers on his head. I assume they were those of a very young heron. This the drawing at bottom right. Also included on this page a Great Blue with his bill open, a Song Sparrow, and a bad sketch of a very bold Catbird.